Falling is a very easy thing to do in Iceland. Tumbling down mountainside scree, losing your footing during a river crossing, feet being lifted and washed away by the Ísafjörður shore. Skipping with toes across rocks in the Icelandic landscape is all too easy when they’re practically begging you to jump all over them. I’ve found that falling became an unintentional favorite pastime during my stay on the island. I thought, what better way to commemorate that than with some equally adrenaline-kicking Icelandic words and phrases? If you’ve been interested in Iceland and you look up “best tourist” attractions or natural phenomena in Iceland, “dettifoss” might be waving for your attention. 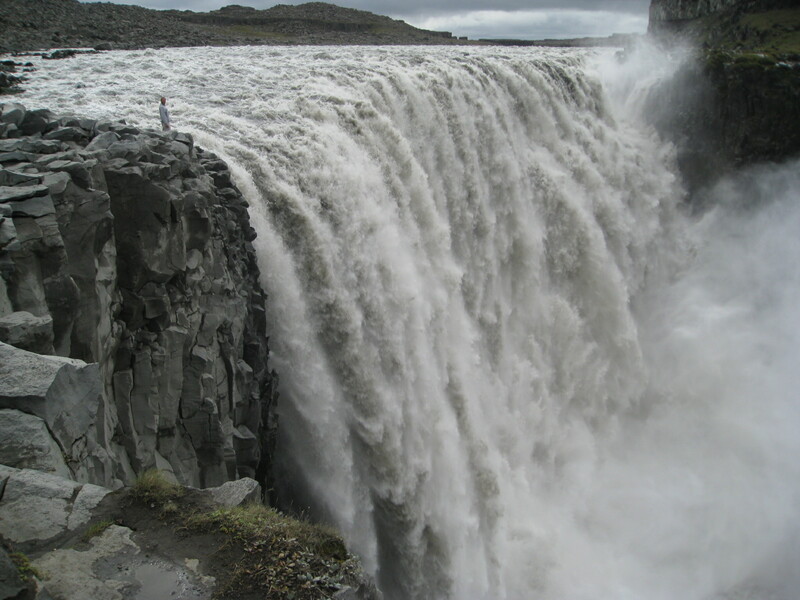 “Dettifoss” is the name of a famous waterfall in Vatnajökull National Park, located in Northeast Iceland. It’s considered one of Europe’s most powerful waterfalls, if not the very one. But the name is quite an interesting one. Knowing that “detti” is a form of “detta” which means to fall, and “foss” is the Icelandic word for “waterfall,” we can conclude that “dettifoss” means “falling falls.” Really descriptive, right? If you hadn’t been given the exact location of these falls, it would be difficult to figure out which of the thousands of waterfalls in Iceland this name would belong to. But given it’s size, one can see the enormity of “falling.” Unfortunately I wasn’t able to see this grand falling waterfall, but there were plenty of other falling falls in its place. Now that we know the word “detta,” we can look at a few phrases that it likes to inhabit. The phrase in question means “something occurred to me” but quite literally translates to “I stumbled and fell in thought.” I’ve always interpreted epiphanies to resemble the opening or awakening of the mind, but in Iceland it seems that it renders a process of tumbling into an idea. Or literally, “It fell over me.” I was first puzzled by this, perceiving amazement to resemble the same awakening or wide-eyed openness, but then suddenly I was struck by how comparable to English this was. Yes, I was struck by it. Something rushed up and hit me and then I realized that the principles here were the same. Overwhelming amazement feels like a blow to the emotions. And perhaps that blow resembles a sudden epiphany, something occurring to someone, “mér datt í hug,” so that they fall into thought. Almost like the previous phrase, but instead of “yfir” or “over,” we have “úr” or “out of.” Or translated literally, “It fell out of me.” I forgot, I lost it, it crumbled out of myself before I could grasp what it was I was trying to remember. 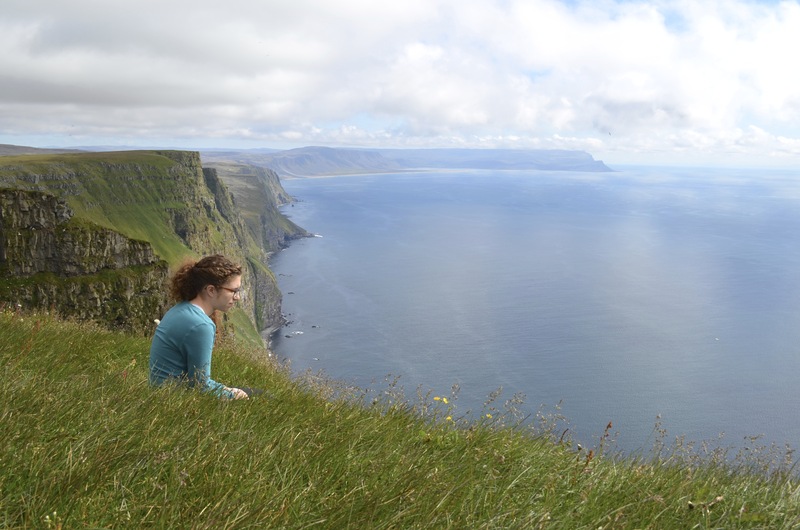 For the sake of applying this concept to my trip to Iceland, I thought back to my moment on top of Europe’s largest bird cliff, Látrabjarg, where I hung off the edge of a phenomenon. I didn’t quite fall to my 440m death, but instead það datt yfir mér, I was amazed by the cliff, it fell over me. This entry was posted in Word of the Day and tagged látrabjarg, phrases, vocabulary, waterfalls, Word of the Day. Bookmark the permalink.